DENVER—In this mountain town, which began allowing the recreational sale of marijuana in 2014, businesswomen and female entrepreneurs say they are launching marijuana-centric companies with the hope that they can avoid the glass ceiling some say prevented them from reaching board rooms and corner offices in other industries. Numbers would seem to bear those sentiments out. According to Marijuana Business Daily, women make up about 36 percent of executives in the legal-marijuana industry, compared to about 22 percent of senior managers in other industries. Women hold just 4.2 percent of the CEO positions at S&P 500 companies. At tech companies like Google and Twitter, disproportionately few executives and engineers are women. “It’s a new chance for many women who have been in the corporate world who couldn’t get to the next level,” said Becca Foster, an independent consultant with Healthy Headie, an in-home cannabis shop co-founded by Holly Alberti-Evans that goes by the tagline “the Mary Kay of Mary J.” A young mother of four, Foster worked as a senior implementation manager at Bank of America before going the cannabis consulting route. “It stalled out,” she said of her finance career; there was no clear way to balance both family and work. But this relative gender parity wasn’t always true of this field. Long before states began permitting the use of marijuana for medicinal or recreational purposes, smoking pot was traditionally portrayed in pop culture as a male pastime. Studies suggest men are still more likely than women to consume cannabis. And several of the women I spoke with said the early days of legalization here seemed dominated by aggressive “frat bro” businessmen. Yet that seems to be shifting with the advent of organizations like Women Grow. 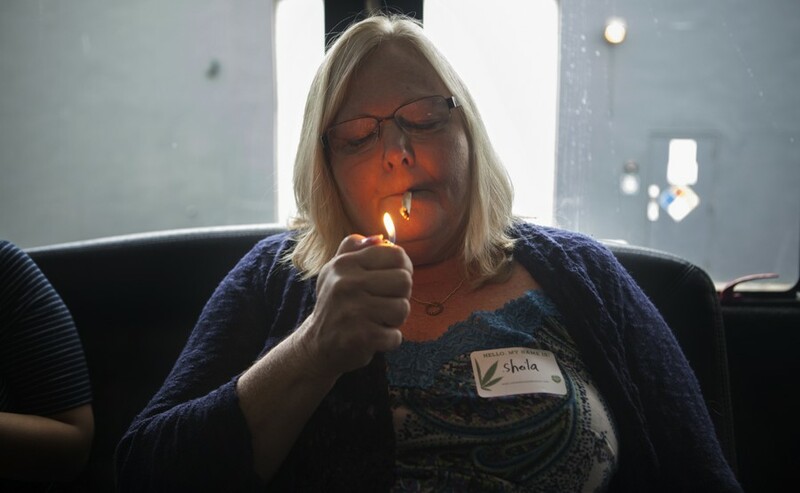 Launched in 2014, the group wants to help women both “influence and succeed in” the marijuana market as more states eliminate laws that make selling and smoking illegal. And it wants them to enter the market early, so that women have as much of a say as men about how the post-legalization landscape develops. In the past couple of years, its membership and reach have swelled to more than 30 chapters across the United States. I met both Foster and Huish at a Women Grow networking event in the trendy and pot-friendly Five Points neighborhood. At this particular meeting—held on the same day some 83 years ago that prohibition unofficially collapsed—dozens of women of all ages and backgrounds gathered to talk about pot-focused philanthropy and to listen to a presentation that suggested women will ultimately lead the cannabis industry. Other Women Grow events have outlined how to launch a company or how to cultivate a client list. While proponents of pot legalization have for years recognized the importance of getting support from women, female entrepreneurs said they are pushing for more than just advocacy and consumption roles in the marijuana market. They are tired of working in industries where the rules are set—and stacked against them. Consider a field like finance; Foster felt she had to be willing to work all the time, which made volunteering at her kids’ school or taking them to extracurricular activities difficult. And multiple women said that in their previous careers, there wasn’t necessarily a camaraderie among workers, who were often rewarded for making the most sales or bringing in the most money, not for helping each other. Cannabis, they said, felt like a chance for a clean start. “I think it’s a chance for women to make the rules,” Foster said. The industry offers its workers more flexibility than something like finance, she said, and there are fewer glass ceilings because everyone is “figuring it out simultaneously.” Perhaps because of their shared experiences in less-accommodating fields, the female leaders in the cannabis industry told me that they tend to be supportive of each other as they navigate what is still a relatively new market. There are also more women entering the cannabis industry because they see market openings and strategies that men seem to have overlooked, such as the Mary Kay-influenced model used by Healthy Headie. Jordan Person, a former nurse, launched a cannabis-infused massage-therapy company called Primal Therapeutics in 2014. She wasn’t expecting to be the self-described “grandmother of cannabis massage,” she told me over tea at a cafe just south of downtown. But no one had thought to launch a company quite like hers. The business took off fast and there was no one else to look to for guidance, so people started coming to her. Now, she gets daily phone calls asking how she launched her business from people around the country, she said. When she isn’t giving massages, Person serves as the executive director of the Denver chapter of NORML, a national group pushing for marijuana legalization. Most of the chapter’s officers are women. The push by women to become involved in writing the rules may also have to do with the idea, suggested by several people I spoke with, that women might be less comfortable than men operating in what is still a legal gray zone. They want a voice in how ambiguous rules are ultimately resolved. While it’s legal in Colorado to buy pot at a dispensary, public consumption is still off limits. That means there aren’t cannabis clubs or other public places where people can officially get together and smoke. While Person can go to people’s homes or hotel rooms, apply her product, and “share” cannabis with clients who are interested (she insists that not all of her customers indulge), she can’t set up a brick-and-mortar storefront. There are several different efforts—at least a couple of them spearheaded by women—underway to bring public consumption to Colorado, but it’s a controversial process and one that’s unlikely to be resolved soon. While Person is reluctant to get into the potential differences between how women and men might approach the industry landscape, several other women said the lack of clarity around what is and is not acceptable might deter women in particular from launching businesses. But other women have deliberately waded into the industry because they want to prevent specific ills they’ve experienced in other industries, such as scientific research being closely guarded for personal and political benefit instead of being shared to drive more discovery, from taking root. Daniela Vergara is an evolutionary biologist and researcher at the University of Colorado at Boulder. She also cofounded the nonprofit Agricultural Genomics Foundation to make sure cannabis research is publicly available to prevent big companies from taking over, she said. Many of the women who have already launched their own companies in places like Colorado, where recreational use has been legal for a couple of years, say they recognize that they are entering the field early and, in some cases, building the scaffolding to go national before too much competition from bigger players pushes them out of the market. But their operations are generally small-scale. If larger companies muscle in with more money and more political clout, some women worry they could lose ground. Emily Jan contributed reporting to this article.